The original Blazer, the K5 Blazer, was built on the frame of a pick-up truck and was produced from 1969 through the 1999 model year. Next came the smaller S10 Blazer, which was then renamed as the Tahoe. Now, in 2019 fans of this classic Chevrolet SUV will be able to buy it in its new form, as a mid-size crossover. There have been many predictions as to what the newly redesigned 2019 Chevy Blazer might look like when it came to the market. Featuring new styling, unique design, and driver-centric tech, the 2019 Blazer is sure to draw serious attention from Chevy Blazer fans. The re-introduction of the Chevy Blazer emphasizes Chevrolet’s strong presence in the SUV market with yet another impressive member of the SUV line-up team. Technology on board the 2019 Chevy blazer focuses on making the driving experience more intuitive and driver-centric while giving drivers and passengers all they need to stay connected. Let’s start with some of the driving experience technology that is both standard and optional on the 2019 Chevy Blazer. Hitch Tech – Both hutch guidance and hitch view technology help drivers have better control over their cargo and tow and haul while driving. There is a rear-vision camera that shows the Blazer’s trailer hitch, and a camera that gives drivers a view from the top-down so hitching without the assistance of an extra person outside the vehicle is much simpler, safe, and accurate. Power Liftgate – This is such a key feature on any vehicle where cargo is involved. Radar detection allows drivers to simply move their foot under the sensor and have the rear-lift-gate open. No need to lift and set cargo down repeatedly, saving drivers time and energy while loading and unloading their goods. Comfort-open windows that allow drivers to remotely roll down vehicle windows in order to cool the vehicle before passengers load in. Adaptive cruise control and a rear camera mirror that lets drivers see more of what surrounds them. Wireless charging and multiple USB ports to keep drivers and passengers powered up and connected while they ride. Chevrolet’s 8-inch infotainment system which offers Wifi for a limited monthly trial and is compatible with Apple CarPlay and Android Auto for the ultimate in navigation, connectivity, communication, and entertainment options available today. All of the technology onboard the 2019 Chevrolet Blazer is made to fit the driver’s needs and create a seamless driving experience that emphasizes control and safety. Many of these impressive features are available standard on most trim models of the 2019 Chevy Blazer, and others are optional with upgraded trims. There are two available engines for the new 2019 Chevy Blazer, both of which are mated to a 9-speed automatic transmission, which is also a new addition for Chevrolet. The standard engine is a 2.5L and offers 193 horsepower, as well as 188 ft lbs of torque. There is also an upgraded 3.6L V6 engine available that offers 305 horsepower and 269ft lbs of torque. One of the more advanced performance features is the start/stop feature that shuts off the engine when the power is not being used at certain times, such as idling in traffic or waiting at a traffic light. Another performance feature that comes standard on all of the new 2019 Chevy Blazers is the Traction Selection feature. Drivers can adjust the driving mode on the Blazer to fit different road conditions while they are driving allowing for adjustments in vehicle traction as road and weather conditions change. The ability to shift and change this in real time significantly improves the function of the Blazer as well as the control that drivers have over their driving experience. The advance traction selection on the 2019 Chevy Blazer also allows drivers to move from all-wheel drive to FWD when the added traction of all-wheel-drive is not needed. As drivers opt to move up in trims to the RS and the Premier, there are more advanced twin clutch and all-wheel drive technologies that give even more options for customizing traction in rain, snow, and rough terrain. The all-new Chevrolet Blazer is design-forward, presenting consumers with some of the boldest design they’ve seen from a mid-size crossover SUV to date. The 2019 Chevy Blazer has a wide stance that makes a bold impression on the road. The Blazer retains its classic sporty appearance from all sides. The 2018 Chevy Blazer demands attention with its bold and aggressive styling, while still managing to achieve and maintain everything drivers look for in a mid-size crossover SUV, like versatility, dependability, cargo space, and dependability. The Blazers design brings a long and sculpted body frame that is highlighted in the front by an attention-grabbing and stylish grille as well as LED highlight lamps and daytime running lamps. In the rear, drivers will love the LED-illuminated dual-element lights and spoiler on the tailgate. 18-inch wheels come standard on the 2019 Chevy Blazer, and drivers can opt for larger 21-inch on the RS and the Premier models. The interior of the new 2019 Chevy Blazer offers a driver-centric design that is comfortable, ruggedly styled, and focused on functionality. The 2019 Chevy Blazer also has the pleasure of being the first Chevy vehicle to introduce Chevrolet’s first cargo management system. This new system is standard on the upper RS, and Premier Blazer trims. The cargo management system features great organization, flexibility of space, and control options for cargo on board the Blazer. 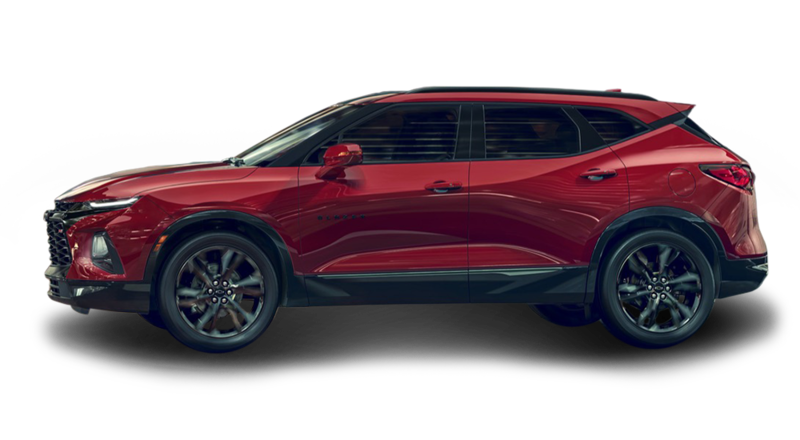 The 2019 Chevy Blazer is available in multiple trims, all of which bring extra style details to the interior and the exterior of the newly designed crossover. Trims also upgrade on performance and cargo options, as well as optional to standard technology for safety, connectivity, and navigation.